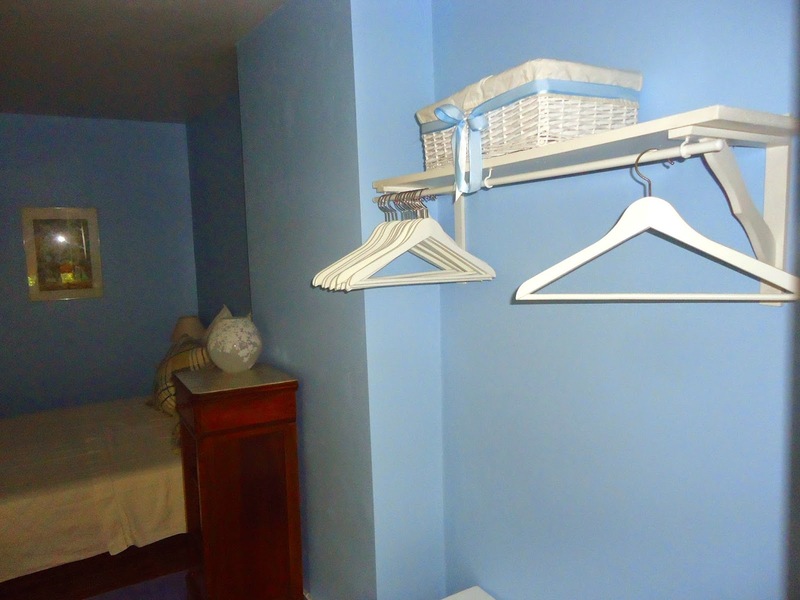 As I shared with you in my post on Too Few Closets here in France, our three guest bedrooms had nothing for closet space. The armoires I wanted were a tad over my budget and I didn't want to settle for the cheaper ones I found. In a house with four bedrooms, only one has any kind of built in storage and it is that bedroom we chose as the master bedroom. I have had to build some "hanger space" in the other three bedrooms for guest use. Each is adequate but I couldn't imagine a family being accommodated by my interpretation of closet space. Closet alternative in the blue guest room. Photo by JoyD. 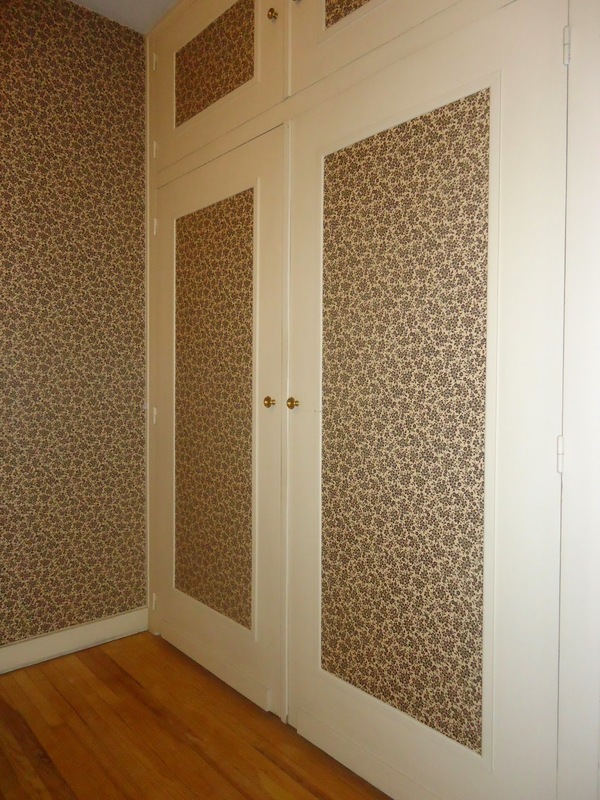 The former owners' son took the armoire and the room was left devoid of closet space. With help from Shirley B who was visiting us from Saskatoon, SK, Canada, we decided to construct a "temporary" closet space until we find the perfect armoire. We bought the brackets and rod at Bricorama in Port Ste. Foy et Ponchapt and had the shelving cut to size at Mr. Bricolage in Pineuilh. It was relatively simple to create and it turned out functional and relatively attractive. Closet doors nailed shut. Photo by JoyD. 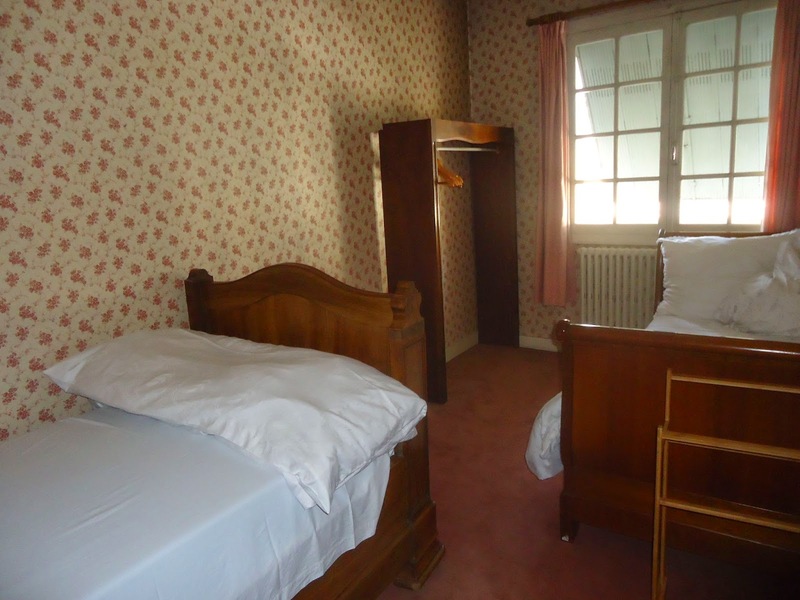 The next chambre was the the one that formerly had a built-in closet but was renovated to accommodate a toilette on the second floor (premier étage in France). The doors were nailed shut by the previous owners and we inherited yet another room with no closet space. 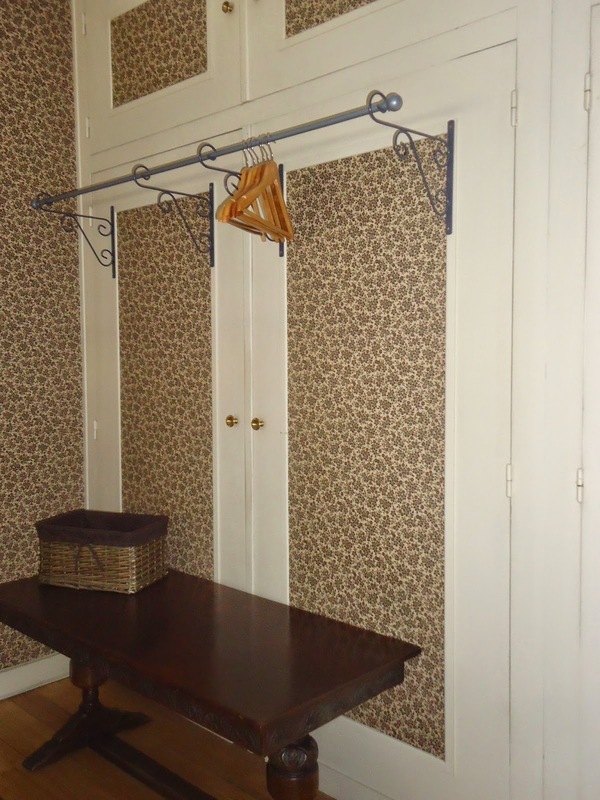 Drapery rod & plant hangers create an alternate closet space. I was pressed for time since we were getting more visitors and so I basically did the same in this room as I did in the blue room. This time, I bought four outdoor plant hangers and a drapery rod and voila, a place to hang clothes, if not a closet. I didn't bother with any shelving. Instead, at the "recycleterie" in Pessac I bought a heavy "coffee table" or at least I believe it was a coffee table and positioned it under the hangers. It's a good height for a suitcase and all of the visitor's possessions can be in one area. 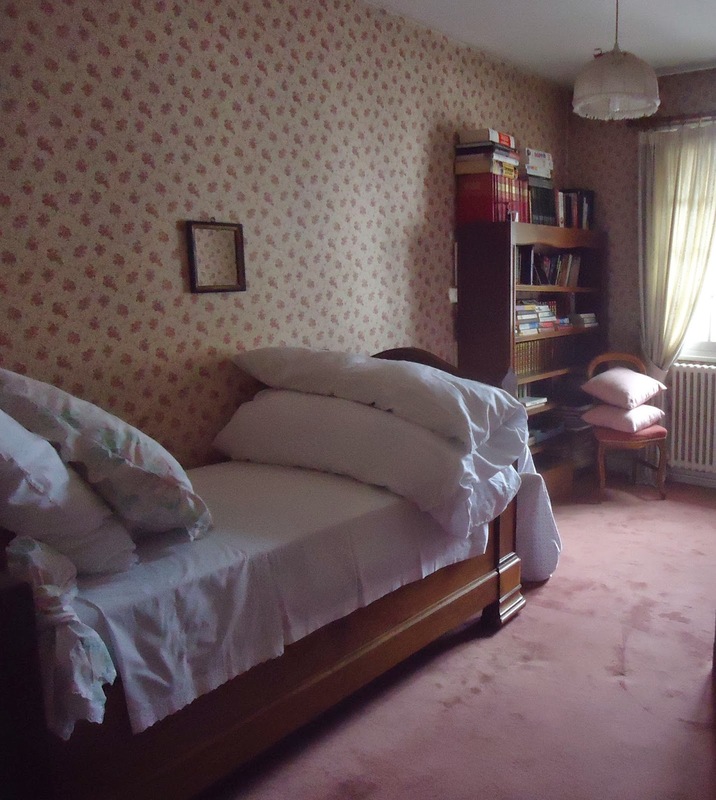 In the pink room, there was a bookcase in the corner that became piled higher and deeper. Two of the lower shelves collapsed and we were forced to relocate all the books to the attic. We still needed some sort of "hanger space" and so we re-purposed the splayed bookcase into an open closet. Bookshelf repurposed into closet space. Photo by JoyD. As a result, here is what we constructed in true re-purposing style. We found some old baseboard in the attic, bought yet another drapery rod, removed the shelving, and stabilized the unit at the bottom so that the board serving as the baseboard is also serving to keep the splayed sides in 90 degree angle form. my guests somewhere to hang a few things. Great work on making new closet space for your guest. You are so creative. Nice rooms too. Thanks Brian. The rooms are full this week. Friends from Germany are here right now with their three children for two nights and then friends from Lyons, mother, daughter and two little ones, will be staying till Friday. 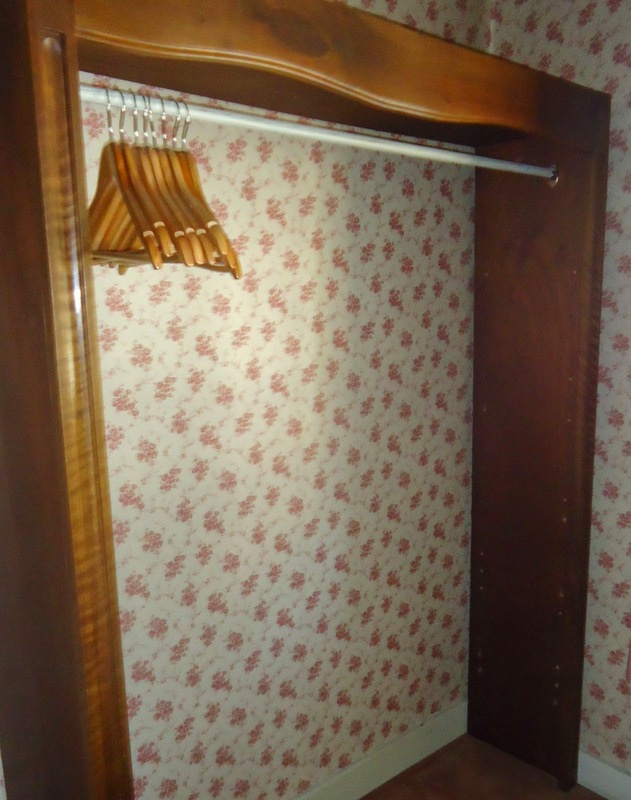 The closets are adequate for short stays. It is a pleasure to host our European friends now. Goodness knows, we were in Europe every second summer for almost twenty years before buying this house and were always welcomed warmly by our French and German friends. It feels good to be able to reciprocate. Thank you so much. The house is changing. This year is probably a good year not to be here because my husband would probably put your husband to work! ;-) In atmosphere and ambiance, it is becoming more and more ours and less and less Mimi and Jean's.